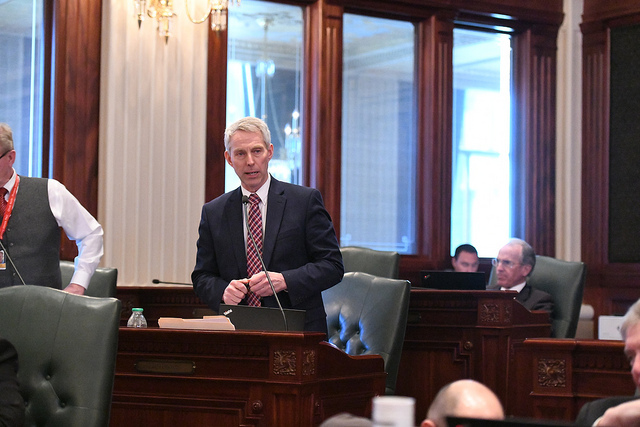 – State Representative Brad Halbrook has advanced measures in the General Assembly that will help improve local government accountability and functionality. Representative Halbrook (R-Shelbyville) won unanimous House approval of House Bill 3137 that will prohibit Mayors or Village Presidents from appointing themselves to other paid Board or Commission positions over which they have appointment authority. Representative Halbrook noted that current law already prohibits Mayors from appointing Aldermen from these same positions. The House has also unanimously passed Representative Halbrook’s House Bill 3141 that sets up guidelines permitting a Township board to temporarily appoint a “deputy” Township official to make sure a vital position can be filled when there is an unexpected vacancy. “Here in our district we recently had a Township Supervisor resign unexpectedly. That’s a position that’s absolutely vital to day-to-day township operations and can’t remain vacant until the next election. My legislation allows for the appointment of a temporary “Deputy” to step in to keep Township operations moving along smoothly,” Representative Halbrook said. Both good government measures have advanced to the Senate for concurrence.